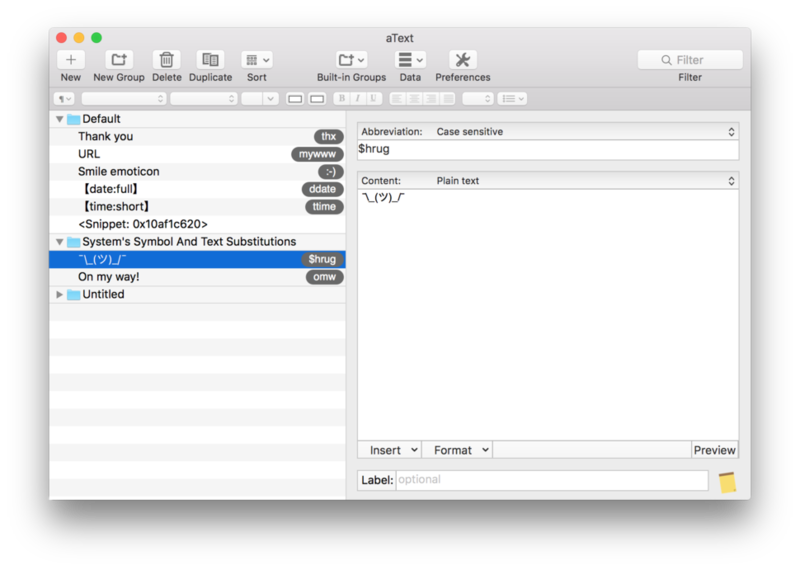 If TextExpander’s subscription service rubs you the wrong way, you have several options that you can buy—and one that’s free. 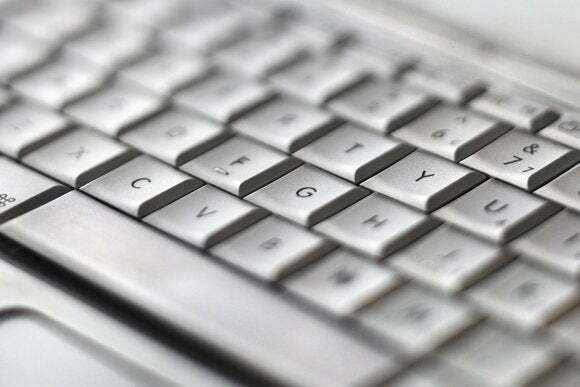 For as long as we’ve been using Macs to type repetitious bits of text into emails and documents, there’s been TextExpander. One of the original alphabet automators, the typing shortcut utility has been at the beck and call of writers and coders for generations, dutifully filling in tedious lines and phrases, and saving precious seconds throughout our day. Even at $45, TextExpander was one of the most essential and popular utilities on the Mac, but a recent change to its pricing structure has longtime users feeling scorned. Smile made the surprising move to a subscription service rather than continue its longstanding policy of paid upgrades, and even after a backlash-induced change of heart that lowered the annual rate to $40 for new users and $20 for current customers, it will still cost something of a premium for access to TextExpander’s snippets. 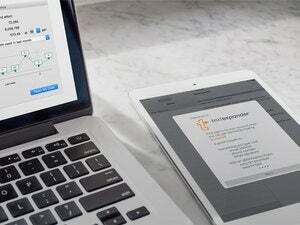 TextExpander might be the most popular expansion service, but it’s certainly not the only one. If you’re looking for a cheaper alternative or just one without such a long-term commitment, check out these apps. aText ($5) might not have TextExpander’s brand recognition or breezy interface, but it stacks up in just about every other way. Calling itself a text accelerator rather than an expander, the affordable app lives up to its billing, speeding up your typing by offering myriad shortcuts for the things you write. Setting up snippets is as quick as using them, and aText gets you started with a few common examples. Simple, clearly labeled fields will get your workflow up and running in seconds, storing chunks of text that will expand whenever and wherever their accompanying abbreviations are typed. Dates, images, and formatting can also be added to snippets, and handy auto-correction tools can help with capitalization and misspellings. Like TextExpander, aText’s greatest strength is the time it saves with the automation of monotony. The interface is hyper-focused on organization, neatly arranging your snippets by groups for easy editing. You can also create fill-in-the-blank templates that can make the most tedious of forms a breeze, and if you have more than one Mac, Dropbox and Google Drive integration will keep your snippets synced across all of them. 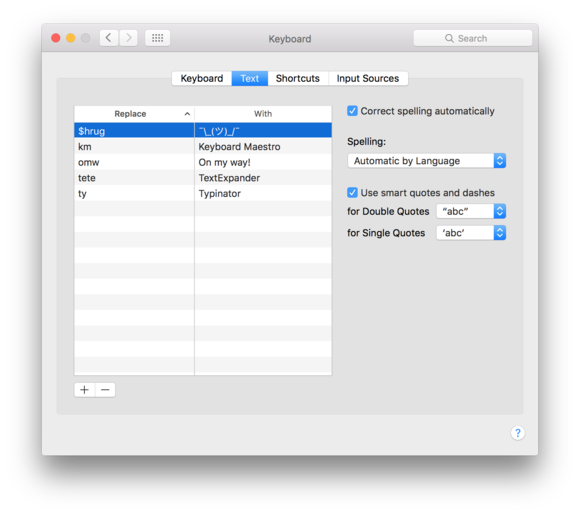 Simplicity and speed are the main features of any text expanding app, and Typinator (€25) has them in spades. With easy drag-and-drop organization and a powerful set of expanding options, Typinator won’t just replace your reliance on TextExpander, it’ll make the transition effortless. Unlike most of its peers, Typinator is strictly a menu bar app. But just because it doesn’t reside in the Dock doesn’t mean it isn’t as full-featured as TextExpander. An expansion can be as simple as setting “tn” to expand to Typinator, but it can go a whole lot deeper than that, with case specification, cursor positioning and a whole word option that only expands phrases when the next typed character is neither a letter nor a digit, protecting against accidental inserts. Beyond common text snippets, Typinator can be trained to perform calculations, or insert the current date and time, as well as create interactive pop-up boxes for fill-in form letters. There are a healthy amount of predefined sets, and code tinkerers can try their hand at regular expressions, which add a unique level of power to your snippet library. Based on the International Components for Unicode, it allows users to create complex expansions that are triggered under much more specific circumstances than a hotkey or phrase. The average user can find myriad ways to save valuable time using text expanders, but for coders they can be an absolute life-saver. Cutting down on the number of times a string or variable needs to be typed can make or break a deadline, and while any of the text expanders here can be configured to help, only Dash ($30) makes it its primary mission. You can use Dash to expand any bit of text, but it’s built to speed up the coding process by cutting down on the thousands of tedious instructions that need to be written. Even before you start adding snippets of your own code, the app will speed up your programming with an exhaustive catalog of language documentation that is accessible from the sidebar. Fully searchable and customizable, it provides an indispensable database of rules and references that will sharpen your syntax. Anything you see can be easily turned into an expandable snippet by copying it and using the create new snippet from keyboard command. Snippets are sortable by programming language and searchable by context, and can be as interactive as you need them to be, with cursor positioning, date and time stopping, and variable placeholders. 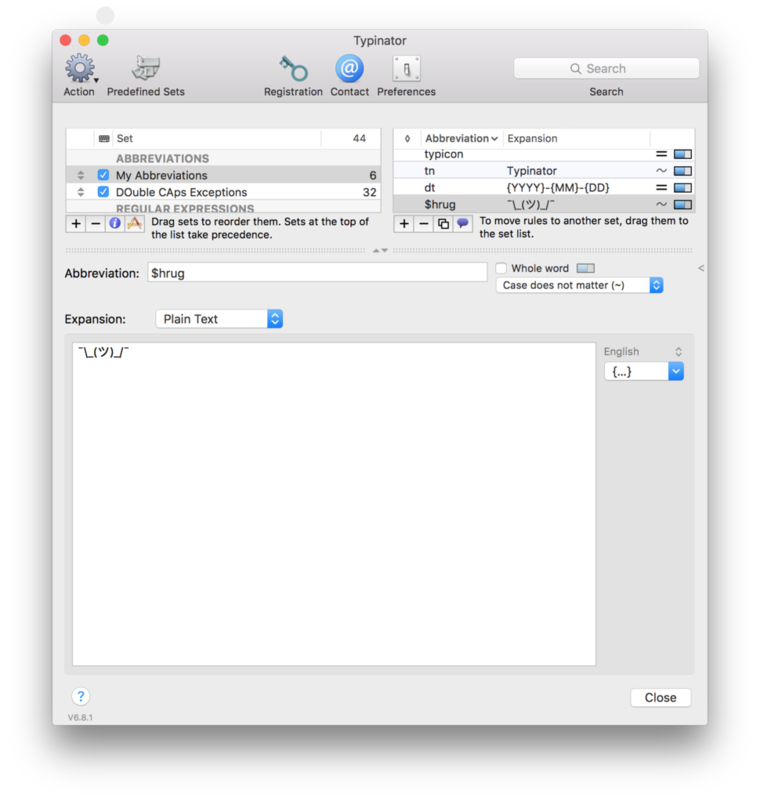 If you’re looking for the original text expander, you might be surprised to learn it actually isn’t TextExpander. TypeIt4Me ($20) has been storing snippets and expanding text since the days of System 6, and it’s every bit as useful today as it was back then. While its interface may have changed, its core concept hasn’t. 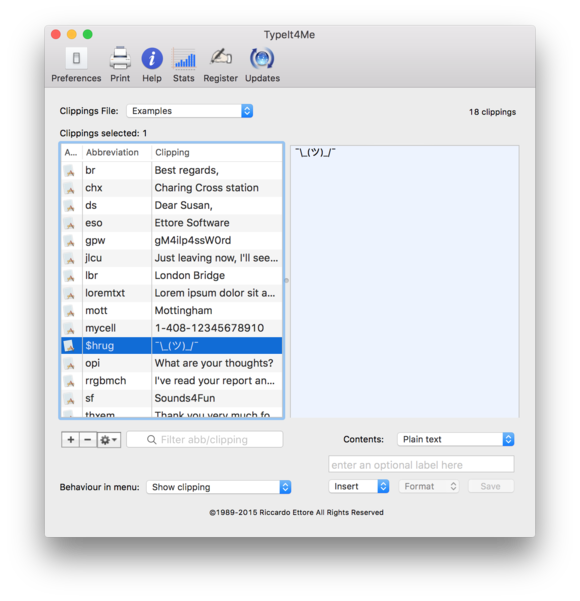 TypeIt4Me is just as easy to use as it was on the day it was launched, with a menu bar- or Dock-based system of snippets (or clippings, as they’re called within the app) that can quickly be added to your document. Compared to TextExpander, TypeIt4Me keeps it super simple, with a clear input window that mimics the ease of an OS X Settings pane. All of the usual options are here: rich text, picture, date, time, autocorrection, etc. But the app doesn’t bog you down with complicated menus. Snippets are given abbreviations for easy expanding, but you don’t actually need to remember them. TypeIt4Me’s unique menu gives you access to all of your clippings, letting you insert them with a click rather than a shortcut. Additionally, Ettore offers a TypeIt4Me keyboard for iOS, matching TextExpander’s cross-platform support. Keyboard Maestro ($36) won’t just fill all of your text expanding needs, it’ll turn your keyboard into a veritable launchpad that will speed up everything you do on your Mac. But even if you just use it for its text expanding abilities, longtime TextExpander users will appreciate its versatility. 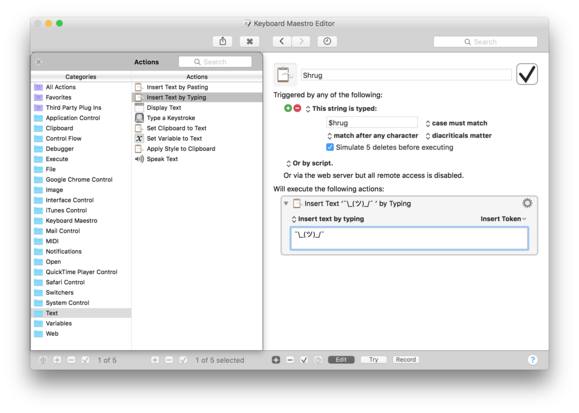 You can use Keyboard Maestro to make a basic macro that turns a string of letters into a line of text, but expert expanders will want to dive into the array of options available. From the abbreviations to the actions, everything is customizable down to the character. For example, when setting a snippet to be pasted rather than typed, you can tell Keyboard Maestro to return the clipboard to its prior contents, so whatever you had manually copied isn’t wiped out. Text tokens make macros infinitely more powerful by adding fields for things like calculations, dates, IP addresses and mouse location, and you can also program how your macro works within specific apps, or set snippets to expire after a set period of time. By piggybacking actions you’ll be able to expand your text in pretty much any way you can imagine whether you’re automating words, sentences or entire pages of type. If you don’t want to pay anything to speed up your typing, there’s a way to do it right inside System Preferences. It’s not as powerful as a standalone app, but Apple has actually baked text expanding abilities into OS X since Mountain Lion. To find it, head over to the Keyboard palette and click on the Text tab. Inside you’ll be able to create basic expandable snippets. It’s text expansion at its most rudimentary, but if you’re solely interested in saving time while typing, it’ll do the trick. You can create snippets in the Keyboard system preference.